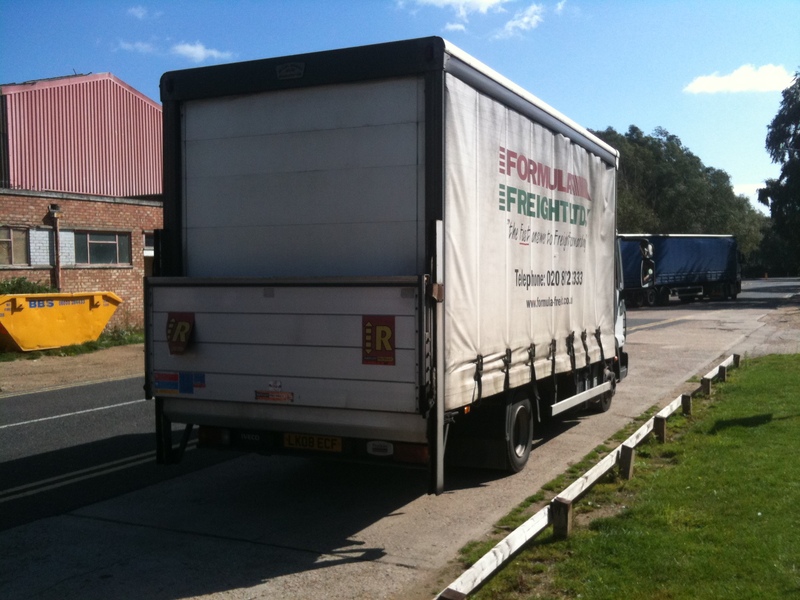 Heavy commercial vehicles (ie, goods vehicles with a gross weight of over 3.5 7.5 tonnes) are uniquely subject to a pretty comprehensive ban in respect to parking on the footway or verge thanks to the Road Traffic Act 1988 (Section 19 and 20, Highway Code rule 246). The only exceptions being when they are “unloading in situations where they are not creating a danger and are not causing an obstruction and are where the vehicle is at no time left unattended” or alternatively if they are stopping to save a life put out a fire! Unfortunately… there appears to be no way to tell from the outside if an HGV is over or under 7.5 tonnes because all HGVs, including the smaller ones with gross vehicle weights of between 3.5 and 7.5 tonnes have the letters HGV on their tax disks. The only way is to ask the driver who is probably not going to tell you if he is being naughty! Here is some basic information to tell the difference between them all. 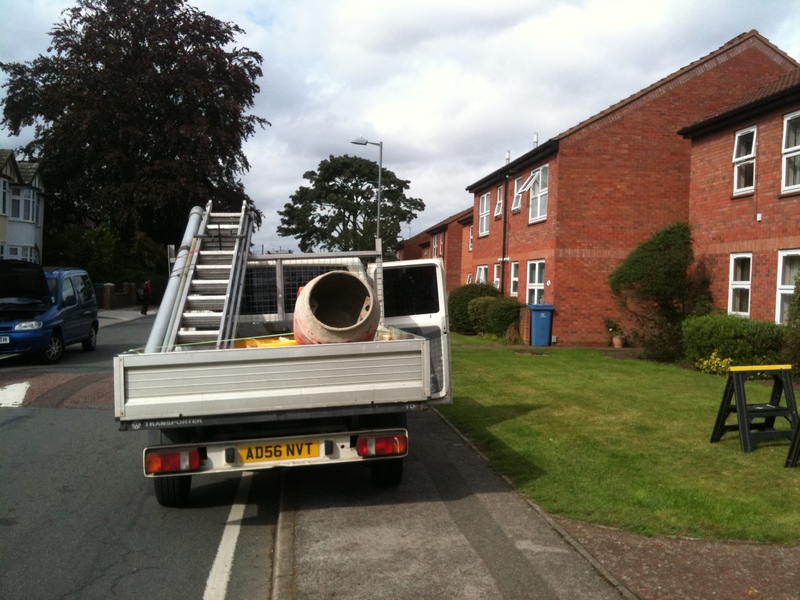 These vehicles which are over 7.5 tonnes, also sometimes referred to as ‘large goods vehicles’ are not allowed to park on the pavement as detailed above. The driver of this vehicle (which I believe to be over 7.5 tonnes) is causing such an offense as he shares a cup of tea and a chat with the staff in ‘Motormania’ while blocking the pavement and delaying traffic and buses on a busy road because there is a place round the back to park and he has left the vehicle ‘unaccompanied’. 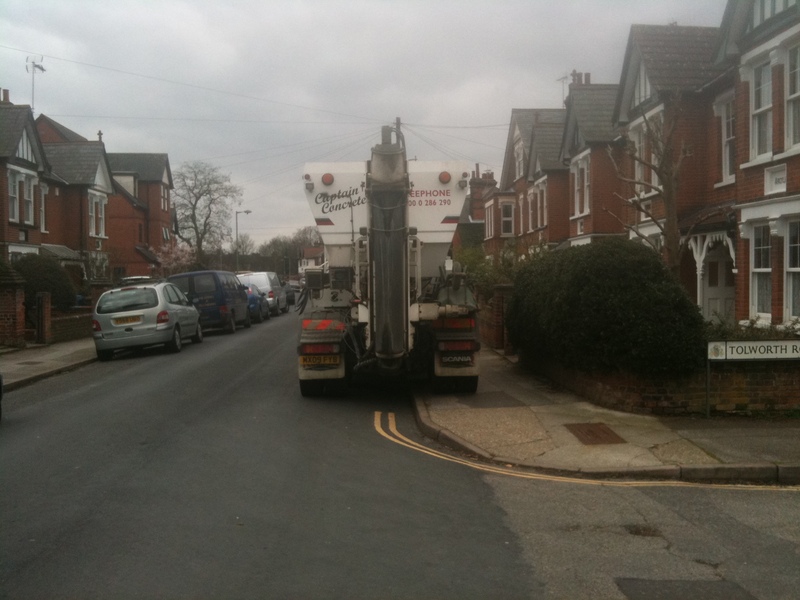 The cement mixer, also over 7.5 tonnes is probably doing loads of damage to the pavement and there seems to be no good reason for it not to be on carriageway so that one is also causing an offence. All of these vehicles have the letters HGV on their tax disks, but unfortunately so do the smaller HGVs and there is no reliable way to tell if a particular vehicle is over 7.5 tonnes. This is definitely an HGV! These vehicles, known either as ‘medium goods vehicles’, ‘7.5 tonners’, ‘large goods vehicles’ or HGVs are unfortunately below the weight limit re the 1988 Act and can therefore can park all over the pavements to the same extent that cars can! In addition, there is no way to be sure if it is under over the 7.5 tonne limit or over. The vehicle in the picture below was parked completely legally btw and the driver was very helpful which is why I knew it was just below 7.5 tonnes. These lighter vehicles, known either as ‘light goods vehicles’ or more correctly as ‘light commercial vehicles’ are also subject to the same weak and ineffective rules as cars. They have ‘LGV’ on their tax disks. Clearly these guys are being pretty thoughtless and the police may consider that they are causing an obstruction, but there is no cut-and-dry offense as there is for the large HGVs. The first guys appeared to make the obstruction even worse by leaving the driver’s door open after I had unsuccessfully tried to get them to move it off the pavement. 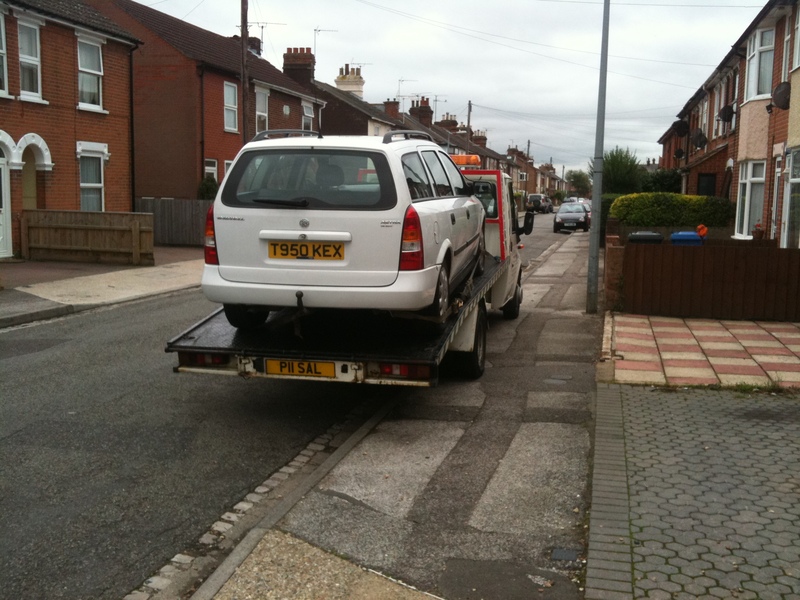 The second vehicle (with trailer) often parks on the pavement but doesn’t always have another car on the back – it must be doing a load of damage to the pavement. The final vehicle is very tall and wide and leaves very little space for anyone to get by but is not quite an HGV. 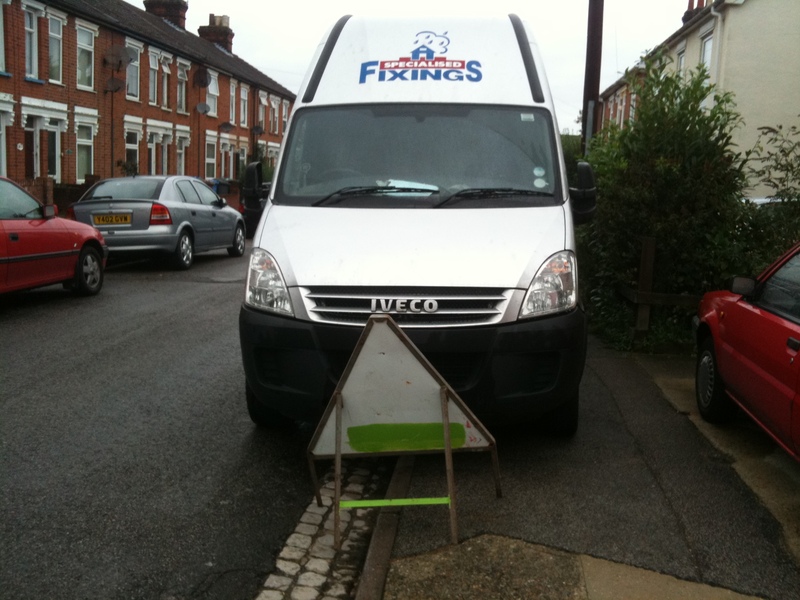 Why on earth do these companies think it is ok to leave vehicles like these on residential streets every night – I guess it is because it is much cheaper and easier for them and their staff than doing the considerate thing- nice! The terms in use at present are pretty confusing. Here is a quick primer. The new official harmonised EU term for an HGV is ‘Large goods vehicle’ which has abbreviation of LGV and was adopted in 2001; the EU also recommended the term ‘Light commercial vehicle’ for the goods vehicles of less than 3.5 tonnes at the same time. Unfortunately the UK previously used the abbreviation LGV for ‘Light goods vehicle’ and the DfT is still in a muddle over these terms some parts of the department using LGV for HGVs and other parts (including VOSA) using LGV for the smaller vehicles. To make it worse the DfT also uses the term ‘medium goods vehicle’ for the smaller end of ‘large goods vehicles’ (ones between 3.5 tonnes and 7.5 tonnes) meaning that a vehicle can both be a ‘medium goods vehicle’ and also a ‘large goods vehicles’ at the same time! They also sometimes use the term ‘larger goods vehicle’ which may be different from a large goods vehicle or possibly not – I have no idea. Anyway, all heavy goods vehicles (including the medium goods vehicles) have the letters HGV written clearly on their tax disk because VOSA does that bit and uses the older terms and also puts LGV on the tax disks of smaller vehicles. I have updated this article following further investigation into how one can tell the different classes of HGV apart (one can’t it seems!). 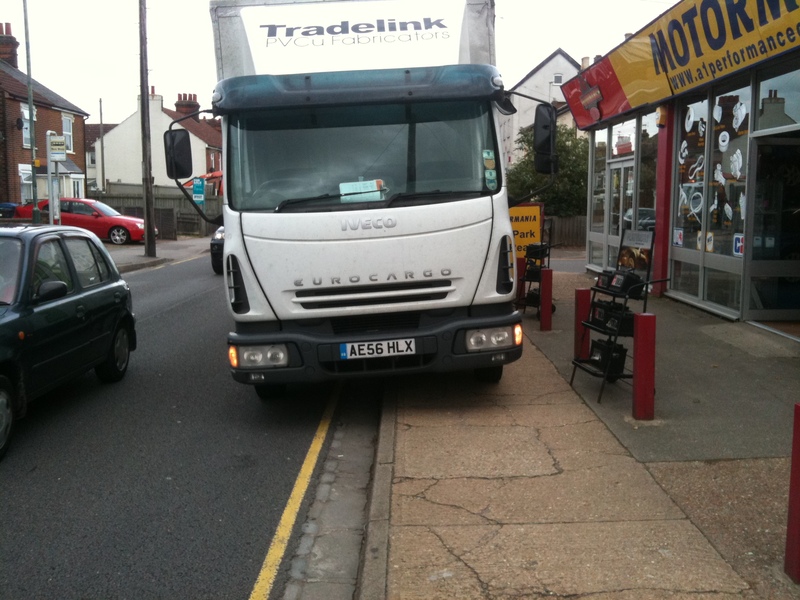 None of this addresses the problem of busses parking on the footpath. DfT says that a heavy PSV is not a HGV and there’s a loophole being exploited. If you’ve got something that can be used to deal with this then I’d welcome the assistance. Is this a commercial bus service bus? If so then what does the owner say? You could try the local paper and see if they will run a story on it. Do also take a photo and upload it to Flickr and add it to the Pedestrian Liberation blog and it will appear on this blog automatically. Yes, commercial bus service, operating as a school bus under contracty to the county. The owner says they shouldn’t be doing it. The driver tried to assault me when I photographed it. local paper is working on something. If you can send me an email address I’ll happily send you the photos. There’s a specific yellow line exemption for commercial vehicles loading and unloading – and if the road is so narrow that other vehicles can’t get past then there is a bigger issue involved than loading/unloading.